Q Security designs, installs and services Intrusion, Access Control & Video Suveillance systems across Missouri. Your security is now in the palm of your hand with home security & automation from Q Security! Q Security is located in Mexico, MO and has provided local security systems installation, monitoring, and support since 1995. Protect your employees and assets. Interactive services for home & business. Q Security’s residential security systems can help protect your home from burglary, fire or unauthorized access. 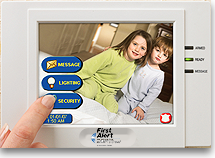 When you choose Q Security, you get state of the art technologies, and easy to use features such as touch screen keypads that make arming and disarming the system simple, motion detection for security breaches past doors and windows, and one touch signal notification for immediate police, fire, or medical emergency assistance. Q Security’s commercial security systems significantly reduce the threat of intrusion, enhance operational efficiency, and protect your employees, assets and customers 24/7. Our trained professionals can evaluate and recommend security solutions for your company’s unique needs. Contact Us today at 1- 888-581-2367 for a free security evaluation. Q Security has introduced the Total Connect suite of digital communication services—a unique new offering from Honeywell that lets you utilize the Internet, PDAs, cell phones, cameras and more to stay connected to your home and business.